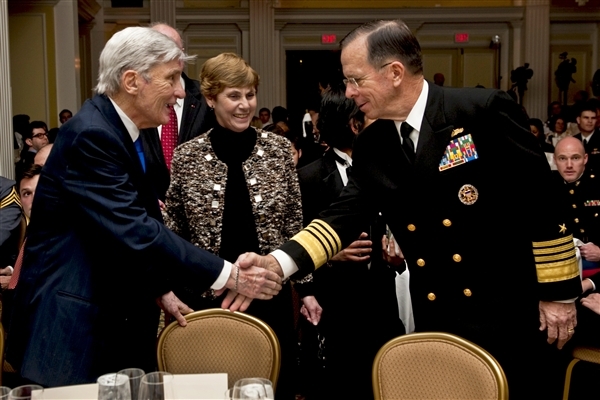 WASHINGTON — Joint Chiefs of Staff Chair­man Navy Adm. Mike Mullen accept­ed the Dwight D. Eisen­how­er Award from the Cen­ter for the Study of the Pres­i­den­cy and Con­gress last night on behalf of all mem­bers of the U.S. armed forces. Navy Adm. Mike Mullen, chair­man of the Joint Chiefs of Staff, and his wife, Deb­o­rah, greet retired Sen. John W. Warn­er of Vir­ginia at the Cen­ter for the Study of the Pres­i­den­cy and Con­gress awards din­ner in Wash­ing­ton, D.C., March 24, 2011. Mullen accept­ed the Dwight D. Eisen­how­er Award for excel­lence on behalf of the U.S. Armed Forces at the din­ner. When the cen­ter select­ed Mullen for the award, the chair­man agreed to accept it -– but only on behalf of the nation’s uni­formed men and women. For­mer Vir­ginia Sen. John Warn­er, past chair­man of the Sen­ate Armed Ser­vices Com­mit­tee, pre­sent­ed the award. Pres­i­dent Barack Oba­ma extend­ed his con­grat­u­la­tions to Mullen and U.S. ser­vice mem­bers in a let­ter. Mullen is a long­stand­ing advo­cate of sup­port­ing U.S. troops and fam­i­lies dur­ing and after their ser­vice for the “needs they deserve,” rang­ing from med­ical care to edu­ca­tion and jobs. “You, your fam­i­lies, and all of the vet­er­ans you rep­re­sent have my unyield­ing sup­port and my deep­est grat­i­tude for all that you have done in ser­vice to our nation,” Mullen told vet­er­ans in the audi­ence from the Dis­abled Amer­i­can Vet­er­ans and the Iraq and Afghanistan Vet­er­ans of Amer­i­ca. The cen­ter chose Mullen for the Eisen­how­er Award because “he is a for­ward-think­ing, ser­vant leader and grand strate­gist who, by look­ing through a long-term lens, has pro­vid­ed unpar­al­leled lead­er­ship in nav­i­gat­ing our men and women of the armed forces suc­cess­ful­ly dur­ing America’s longest war,” said Jonathan P. Mur­phy, the center’s com­mu­ni­ca­tions direc­tor. The chairman’s vision for the future includes jobs for vet­er­ans. Mullen said vet­er­ans are ready and will­ing to con­tin­ue serv­ing their com­mu­ni­ties, and when com­mu­ni­ties help vet­er­ans tran­si­tion to civil­ian life, he fore­sees a “win-win” rela­tion­ship. “[That part­ner­ship] makes a pos­i­tive and last­ing impact on our nation and the young men and women who have served, for decades to come,” the admi­ral said. Mullen also encour­aged old­er vet­er­ans to men­tor the younger ones. “Men­tor­ship knows no rank or age lim­it,” he said.